If I then create a new subgoal it still gets the color of the parent. For the first subgoal (created for this parent) I would prefer to get a goal without any color. 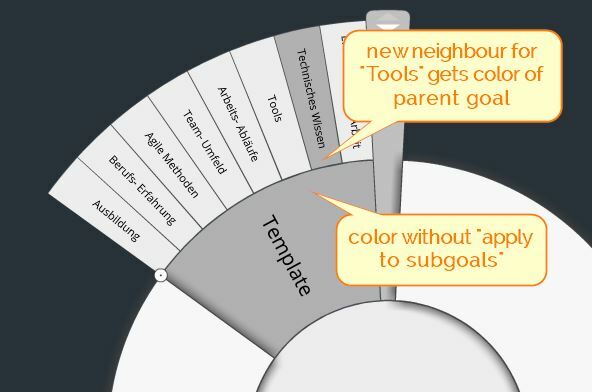 If I now give this new subgoal a different color and add a neighbour goal -> it also gets the color of the parent goal. For subsequent neighbours of the new subnote I would prefer to give the new neighbour goal the color of the previous selected goal when creating it. If hope the attached image helps to understand what I mean. Thanks for taking the time to contact us about this. We are aware of an issue where color is applied to new subgoals of a parent that has a color applied, even when 'Apply to subgoals' is not applied. We will fix this in a future update. We do not however intend to implement the automatic application of a goal's color to a new Neighbor added: it may not be desired in some cases, so we would need to include an extra 'Apply to neighbors' option. If you want to apply the same color to a set of neighbors you can apply it to the parent with 'Apply to subgoals' checked'; then, if required, uncheck that option and remove or change the color applied to the parent. Thanks, fine it will get fixed. I understand your point about the neighbor color - no big deal for me. Great, thanks for your understanding.